I’ve just spent what I can only describe as an inspirational hour with your pedal! I’ve not had this much fun since I got my first delay pedal. I’ve installed it on my pedalboard and in the context of everything else I have it’s just brilliant. It’s so much the “fuzz” I’ve been looking for. The design and build of this pedal is sleek and robust. The neon blue on ''LED'' adds the finishing touch to an impeccable looking piece of kit. After playing around with this pedal I was amazed at the amount of permutations that can be achieved. Whether creating a slightly dirty blues sound, a heavily fuzzed 70's rock tone or subtle warm fuzz overtones, they were easy to find. I played through this pedal with various guitars ranging from 'Les Paul' style guitars, Ibanez floating/locking tremolo type guitars and acoustic guitars. Each and every option created new and exciting effects. Also when set up through my digital effects board, it embellished and finished off some sounds I had already been working on, fantastic! Switching between pickups in turn had some cool results. I'm looking forward to recording and performing live with this new addition to my arsenal. 'Fuzz heaven!' - Tim Page - Session guitarist. 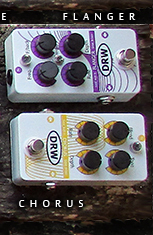 Been to DRW to try out various pedals and amps and am absolutely blown away by the stuff! The prototype amp that they have is incredible. My SG has never sounded so good. Only problem now is that my crappy Peavey amp sounds pants compared to the DRW one. However, there is a silver lining 'cos I tried out the V2 twin-valve pre-amp pedals and this managed to get my amp, whilst nowhere near the beautiful sound that came out of the DRW amp, at least sounding good again. Couple this with the DRW Overdrive pedal and it's pretty amazing. 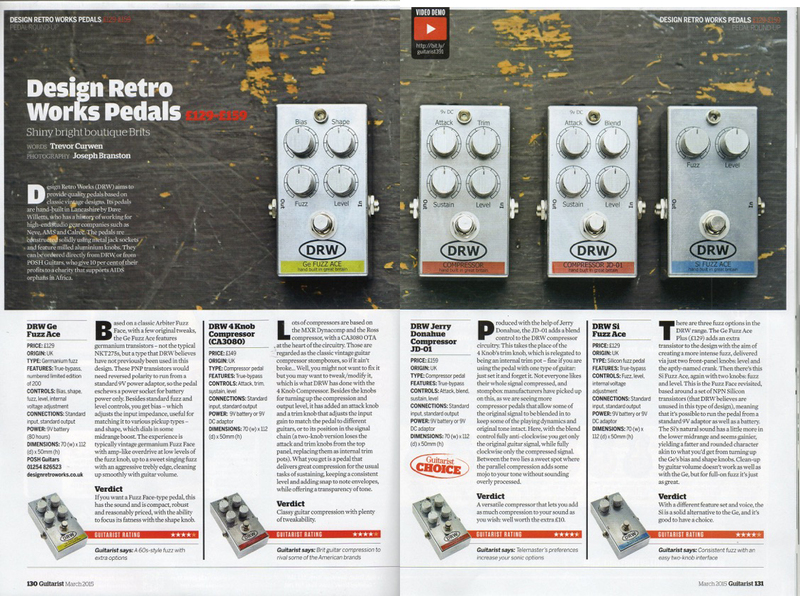 I'm surprised at how different the two circuits are; being able to switch from a silicon overdrive to a germanium is like having two pedals in one. I know what's going on my Christmas list!! Please hurry if you fancy owning one of these little beauties! The JD-01 is probably the best compressor I've ever used. Slow attack is wonderful for swelling harmonic frills - faster attack smoothes out any blemishes in my picking technique (thanks for making me sound so good) and the increase in gain I get when I turn up the sustain makes my strat sing! The blend control is the icing on the cake though - what a genius idea. I can have all the benefits of compression without sounding like I have a compressor on. Thanks guys. - Bill B.
I play guitar in a covers band playing stuff from the 70’s, 80’s and 90’s (punk, post punk, new wave – that sort of thing) and so a chorus pedal, flanger and delay would appear to be mandatory. A compressor is a much more subtle effect than any of the above, and it’s been easy to think that I could live without one. Now I’m not so sure. 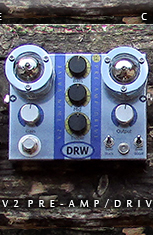 Having the DRW compressor, I have to say I’m very impressed. Suffice to say that this pedal looks great, is extremely well made and does all the things that a compressor should do, very well indeed. It’s made with top quality components, has a true bypass function and is very quiet in operation. It can be used as a clean boost, to increase sustain, to help overdrive an amp, to compress the sound of course, and goodness knows what else with a bit of twiddling of the four knobs on the front. (Level, sustain, trim and attack). I did think the on/off switch looked to be a bit too close to the control knobs, but in practice this didn’t seem to be an issue. Best of all it’s hand made here in the UK, in the Rossendale Valley, Lancashire. So that’s got to be good. - Liam Spencer – Fine Artist and guitarist with "The Crimpolenes"
Every now and then I buy something on impulse - this is the first time it's been better than I thought it would - its kind of like a fattener for bass - half overdrive half fuzz and better than both. I use it all the time now as kind of a boost pedal live. I'm toying with the idea of getting another to use more full on at the same time. It's that good - (wonder if you'd give me a discount?) - Jeff.